Imagine being behind the wheel, and the harsh glare of the sun obstructs your view of a child in a school crosswalk. Or you turn a corner, and you don’t see the jogger through the thick of the fog. Or a teenager, distracted on a mobile phone, crosses your path at exactly the wrong time. These are just a few scenarios where lighting, fog, road configuration, and other vehicles can delay and obstruct a driver’s view of pedestrians – and the outcome can be fatal. What if our cars could alert us to make it safer for pedestrians in the road? 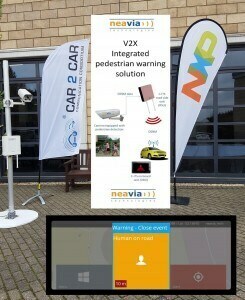 That’s exactly what our partner Neavia Technologies set out to do with the world’s first V2X pedestrian warning solution. The solution combines the Neavia V2I station – a cooperative intelligent transport system (ITS) roadside unit – with a connected Neavia EcoCam Plus camera to detect pedestrians. As soon as a pedestrian nears or crosses the road, the camera alerts the road side unit. This roadside unit then sends an alert instantly and securely to nearby vehicles, warning the driver of the approaching pedestrian. Developed by NXP and Cohda Wireless, RoadLINK is used in the Neavia V2I station to exchange messages reliably across an extended range at high speed, cutting ‘time to react’ and communicating potential hazards and safety-critical scenarios significantly faster than other applications. RoadLINK is based on IEEE 802.11p wireless communication protocol, a proven standard backed by a decade of testing with European, U.S. government, and professional institutions. Compared to slower and less reliable cellular networks, the 802.11p wireless protocol allows the RoadLINK solution to deliver deterministic performance for safety-critical applications like Neavia’s pedestrian warning solution, and also provides high levels of security and privacy protection. Furthermore, the Neavia solution is fully secured and compatible with advanced PKI infrastructures. Neavia V2I station decentralized emergency notification messages broadcasted to nearby cars meet both 802.11p and European Telecommunications Standards Institute (ETSI) standards. Compact and with low-power consumption, this V2I station can be powered by a solar panel so it can be used where no main power is available. Neavia’s V2X pedestrian warning solution is a step forward for road safety and pushes us one step closer to the promise of safety that autonomous cars will bring us.